This is a very clever use of Facebook. 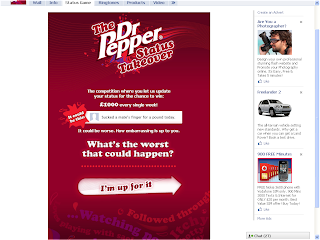 Building on their strapline "What's the worst that could happen", Dr Pepper (in the UK) wants to be able to post random bizarre updates as their fans' statuses. Very clever, and a very good way of using Facebook. I'm guessing that the winners will be people who get the most comment, or most bizarre comments or something.